Walk down any street in Vietnam and it quickly becomes apparent this is a country that's crazy about coffee. Everyone at Hanoi's humble Cafe Giang however, is after something more than just a caffeine fix. 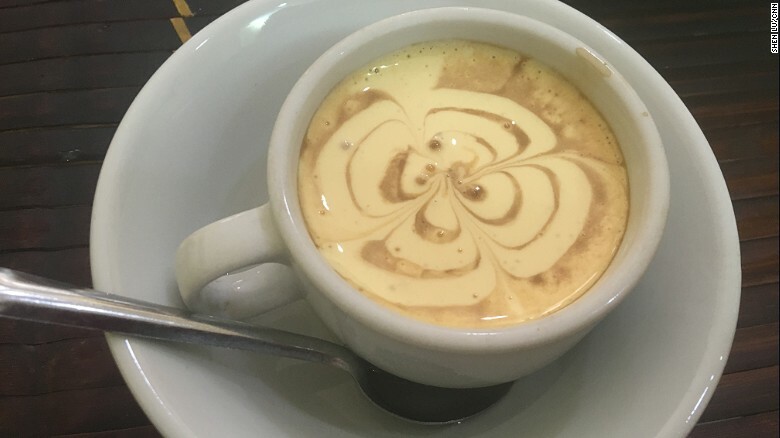 There've come for "cà phê trúng," or egg coffee, a Hanoi specialty in which a creamy soft, meringue-like egg white foam is perched on dense Vietnamese coffee. Behind him, there's a modest, open-plan kitchen where a modern, red mixing machine is whirring constantly, whisking up eggs and other parts of the recipe. Van Dao visibly swells with pride when asked about the cafe's most famous drink. "I've never had a client not like it"
"For the vast majority of our clients, the egg coffee experience is a revelation" he says. "The wow factor is high. When I start describing it, they can't put two and two together. 'Egg' and 'coffee', together? It's pretty hard to get a coherent image of those two ingredients in a cup together. It's always fun. "It is a very decadent way to get a caffeine hit, let's face it." "The older generation prefer to sit at sidewalk cafes, smoke cigarettes and socialize," explains Frith. "Many will sip on coffee all day long. "The younger generation is into the more European-influenced cafe experience, going out to be seen in cafes and to socialize with friends. Many of these cafes are decorated like discotheques, with loud club music to match." "Anything mixed or blended with milk and sugar will find an enthusiastic audience." Something that Cafe Giang's Van Dao knows all too well. "The difference is in the recipe," he says, matter-of-factly. "Many others have tried to copy it but the taste is just not the same."